In December 2014, Cuba and the United States declared the reestablishment of their long-severed diplomatic relations, yet most restrictions on the basic freedoms of association, peaceful assembly and expression remain in place in Cuba. Tal y como habíamos informado anteriormente en el CIVICUS Monitor, un nuevo decreto que restringe las expresiones artísticas entró en vigor en diciembre de 2018. Los activistas que se oponen al Decreto 349 siguen enfrentándose a varios tipos de restricciones, incluidas las detenciones arbitrarias. Independent CSOs are denied legal status in Cuba. In accordance with the 1985 Law on Associations, the government will not register any new organisations that are not supervised by the state. Independent CSOs are denied legal status in Cuba. In accordance with the 1985 Law on Associations, the government will not register any new organisations that are not supervised by the state. The Cuban Commission of Human Rights and National Reconciliation (CCDHRN) has unsuccessfully requested legal recognition ever since it was founded in 1987. Membership in unrecognised organisations is considered a criminal offense, punishable with fines and prison time. Human rights defenders who document human rights violations experience regular threats, assault and short-term detention. Those working to defend the rights of persons deprived of liberty for political reasons are particularly targeted. Just during the first month of 2018, the CCDHRN reported 330 cases of arbitrary detention. Peaceful demonstrators are routinely detained for exercising their right to protest, in some cases even pre-emptively. Peaceful demonstrators are routinely detained for exercising their right to protest, in some cases even pre-emptively. Protest rights are particularly denied when protestors have the opportunity to appear in the international spotlight - such as in 2016 when in the run up to President Obama’s visit, more than 50 members of the Ladies in White organisation were arrested while hosting a peaceful protest in Havana. 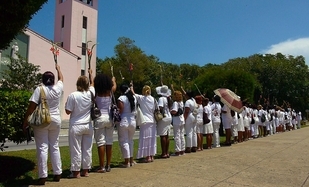 Although dissent has become more visible on the streets over the past decade—such as the Ladies in White march in Havana every Sunday—demonstrators are still regularly harassed and detained by the police and state security. While in detention, people are frequently beaten, threatened and held incommunicado. Virtually all traditional media – newspapers, radio and television – are controlled by the state, as the Constitution expressly prohibits private ownership of media outlets. Virtually all traditional media – newspapers, radio and television – are controlled by the state, as the Constitution expressly prohibits private ownership of media outlets. Independent journalists and bloggers, and sometimes also former reporters of official media covering “sensitive” issues, regularly suffer harassment, blocking of mobile phone services, house arrest, public repudiation, short-term detention, and occasionally long stays in prison. Despite legal and technical obstacles, the number of active independent bloggers and citizen journalists has increased exponentially. Alas, due to low Internet connectivity – particularly in rural areas – a very low percentage of Cubans are able to read their posts. Internet connectivity is also improving as Internet cafés began opening in 2013, email became accessible via cell phones in 2014 and public Wi-Fi hotspots began to appear in 2015.